A one hour prayer meeting is held in the church every month. Click here for the calendar of dates and details. For a complete listing of the Service Rota click on the link below. The rota includes all detail of each individual service including the type of service; preacher, the leader and also details of the readings together with the names of those designated to read, plus sidespeople and welcomers. The Microphone – please do make sure you move it to be in front of your mouth. This is particularly important is you follow someone who might be significantly taller (or shorter) than you. As the notes say you can’t damage the microphone – unless you take a sledgehammer to it! • Readings are normally taken from the Good News Bible. If you decide to use a different version, please let Mary Wilson know which version you have chosen as she needs to prepare the screen script on the preceding Wednesday morning and possibly add the text to the Newsletter. • Find your Reading in the lectern Bible before the service; mark it with one of the bookmarks. • There is often a hymn immediately before a Reading or the Prayers. Move to the lectern during the last verse of the hymn so that you are in place to begin the reading soon after the hymn finishes. It will also give you time to …. • Even using the microphone you will need to speak up. Don’t drop the level of your voice, particularly at the end of a sentence. • If you are a Reader, please remember to prepare a short introduction to your reading; two or three sentences are sufficient. • Take your time as you read. Even though people in the congregation will probably be following the reading on screen you need to give them time to absorb what you are reading. To those reading scripture in services. As you know we present the bible readings on the screen for people to follow. The default translation is The Good News version. If you intend to read from a different translation could you let Mary know and she will ensure that the translation being used is shown. More importantly though, please could you check with the preacher that the translation you intend to use is compatible with their sermon/talk. There are some significant differences between translations and it might water down a sermon if the translation read out doesn’t contain the same phrases as the one used to prepare the talk. Tonight’s monthly prayer hour is cancelled becvause of the Lent Course. This Passion Sunday service will be led by the Revd Jlohn Aston who is also preaching. ‘Early Birds’ will this week include All Age Communion with the Lesley Matile leading and Carol Law preaching. This Passion Sunday service led by Carol Law who is also preaching. The APCM – Annual Parochical Church Meeting with elections and reports submitted. All are welcome. Once again Early Birds will be brimming with all the usual ingredients of songs, craft and Bible stories on this Palm Sunday. Di Proctor leads this Palm Sunday service with Alan Bateman preaching. An Agape Communion with bring and share supper. 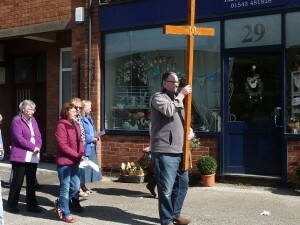 The annual Good Friday Walk of Witness begins at Trinity Methodist with various stopping places in the villaghe before arriving at St John’s Church for a short contemplative service. Early Birds starts Easter Day with all the usual fun with games, music and Bible stories. The Easter Day service is a joint service with the Trinity Methodist congregation. You’ll find us in the middle of Shenstone on top of the hill. Come and see us.